Try our intensely spiced coconut and tomato fish curry inspired by Goa on India's west coast. 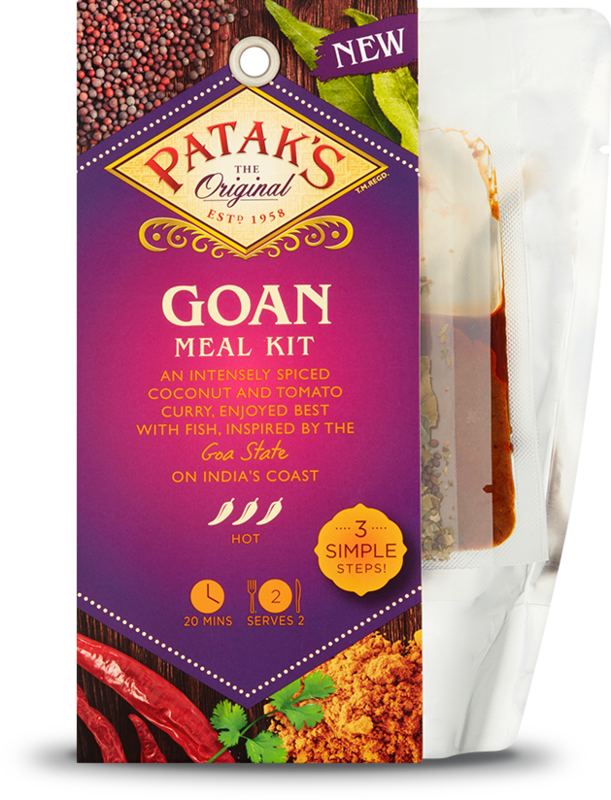 Our new 3 Step Goan Curry is packed with flavour and spice – a great, fuss-free dinner for two, ready in just 20 minutes! An intensely spiced coconut and tomato curry, enjoyed best with fish. Inspired by the Goa state on India's coast. In a pan, gently fry the whole spices in 1tbsp of vegetable oil for 20 seconds. Add the Patak's Spice Paste with 50ml of water and gently fry until the water is almost evaporated. Stir in the sauce and simmer for 3 minutes. Add the fish and cook for a further 10 minutes or until the fish is cooked through. Serve garnished with chopped coriander, on plain basmati rice. Our unique recipe is filled with sultanas and coconut with a hint of cinnamon and green cardamom and flame-baked in a tandoori style oven to create a delicious naan. Perfect for dipping into our delicious curries or serving with our chutneys and pickles to help create the perfect curry night in. I absolutely LOVE this recipe - the flavours of Goan cuisine are characteristicly spicy and intense and this dish is no exception. The delicious spiciness you get from our Vindaloo Spice Paste, combined with sweet pineapple and the cooling Beetroot Salsa is simply divine. Goan cuisine is often notable for its spiciness, and these luscious burgers are no exception - they are simply bursting with flavour. Our Madras Spice Paste gives a lovely blend of coridander, cumin, turmeric and chilli, and served on a bed of rice with a squeeze of lemon these are tender, flavoursome and delicious. Or serve up in a burger bun with your favourite condiments. A South Indian classic, this tasty side is a refreshing change from plain rice - it has a real zing to it. It uses our Biryani Spice Paste, which gives it an extra spicy flavour.